If you were to ask me, “If you were stranded on a desert island and you could only have one type of alcohol, which would it be?”, I’d probably say, “Tequila.” It’s strong, it’s warm weather-friendly, and as long as it’s 100% agave, it’s not very easy to mess up. The Tasting Lab, neater than it has been in quite some time. But hold on a second – that’s not to say that tequila is hands down my favorite spirit. There are just too many to pick from, and to me, the optimal spirit depends on the circumstances. It’s usually assumed that the desert island scenario refers to a tropical island, palm trees and all, and if that island was tropical, then yes, tequila would be my first choice. But if this were an island somewhere a little farther away from the equator, maybe in the Arctic, or even in the middle of one of the Great Lakes, tequila wouldn’t be my first choice. It would definitely have to be scotch. The peaty smokiness, the fiery black pepper tinge, and the light sweetness of scotch make it a perfect cold weather spirit, and on a slightly chilly night like last night, that’s what was on the menu. I’m usually a fan of the brutally peaty Islay malts, but sometimes I don’t have the cash to splurge on a bottle of Laphroaig or Lagavulin. Sometimes I just want something I can drink a lot of, and not feel bad that I just drank what could have been a week’s worth of groceries. And that’s where the Glen Silver’s Special Reserve comes in. This modestly-priced blend comes in at $15.99 per bottle – even less than some of its bottom-shelf competitors. I have to admit that the low price put me off at first, but I enjoyed the 8- and 12-year scotches from Glen Silver’s, so with confidence, I removed the golden screw cap on this rather nice-looking bottle and went to work. Before I get into the taste, here’s some info on this blended whisky. Deep golden brown with slender but extremely slow legs. Sherry oak, light honey, toffee, and peat. Neat, this whiskey was somewhat full-bodied with notes of black pepper, tar, hay, and a bit of honey sweetness. Adding a few drops of water mellows it greatly, allowing a subtle nutty taste to come through. The finish is long with lots of oak and a bit of peat. Judging solely from the price tag, I was expecting some of that distinct cheap whisk(e)y taste – that overwhelming peppery bite and vodka-like alcohol aftertaste that you get from ordering a shot of whiskey at a bar, without specifying what kind – but the Glen Silver’s Special Reserve, while not mind-blowingly complex, was smooth and tasty. While the price is suspiciously low, the Glen Silver’s Special Reserve is one of the better blended whiskies I’ve had, including some of the higher-end, bigger-name blends. It’s smooth, but it still has that peppery, smoky edge I look for in a fuller-bodied scotch. I could happily sip a couple of glasses of this on the rocks before (or after) dinner, but since it’s so inexpensive, I wouldn’t feel bad making a Rob Roy or a Rusty Nail out of it. 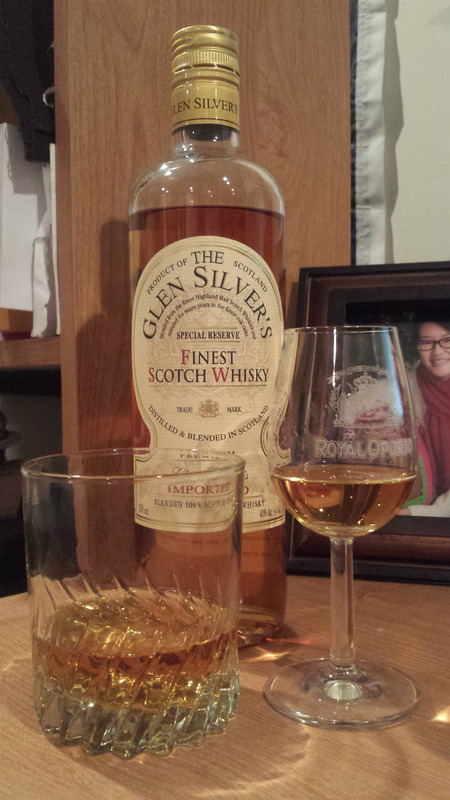 It’s no single malt, but the Glen Silver’s Special Reserve has definitely earned a space in my liquor cabinet.